RPS Expansion and Wall Curbing allows for uniformity in method and design while also providing excellent flashing and termination points with a watertight installation. This RPS system includes expansion joint curbs in desired lengths, fully mitered one piece inside and outside corners, sloping end sections, spreader clips, and connector clips. By utilizing this economical, time-saving system, roofing can begin as soon as the deck is in place. There is no need to wait for the mason or siding contractor to erect walls to allow properly terminating the roofing system. This system installs in a fraction of the time required for field built arrangements and is designed to meet any roofing system needs while allowing single source responsibility. 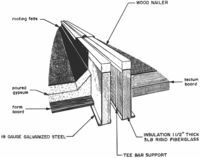 Excerpt from N.R.C.A Manual: Are Roof Expansion Joints Necessary? The necessity for expansion joints, of course, depends upon the design and size of the building. We would like to point out, however, that hundreds of buildings are being constructed, from plans out of good architects' offices, without any or without enough roof expansion joints. On any rather long building, having wings extending from the main portion of the building, a roof expansion joint should be provided at each junction of the main portion of the building, with a wing. On buildings 150 feet or more long a roof expansion joint should be provided at each change in deck direction. Every building having a length of more than 200 feet should have a roof expansion joint. See that curb type expansion joints are used and/or detailed. Never use the Metal "U" type expansion joint on a roof.